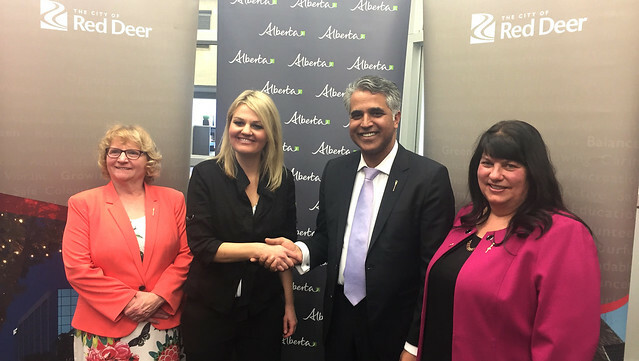 Minister Sabir with Mayor Veer, Red Deer-South MLA Barb Miller (L) and Red-Deer North MLA Kim Schreiner (R). Identified by the City of Red Deer and local stakeholders as a top priority, the 24-7 shelter will offer wraparound supports in the province’s third largest city. The province is funding $7 million to help build the 120-bed facility. The new capital funding is in addition to $3.8 million in annual provincial funding provided for Housing First programming and $1.1 million to operate the People’s Place Adult Emergency Shelter and the Winter Warming Centre. Another $324,000 was recently allocated for the Warming Centre to extend its operation to September 2019. This funding represents a first step to getting a 24-7 shelter built for Red Deer. Additional provincial funding needs will be assessed as this project moves forward.